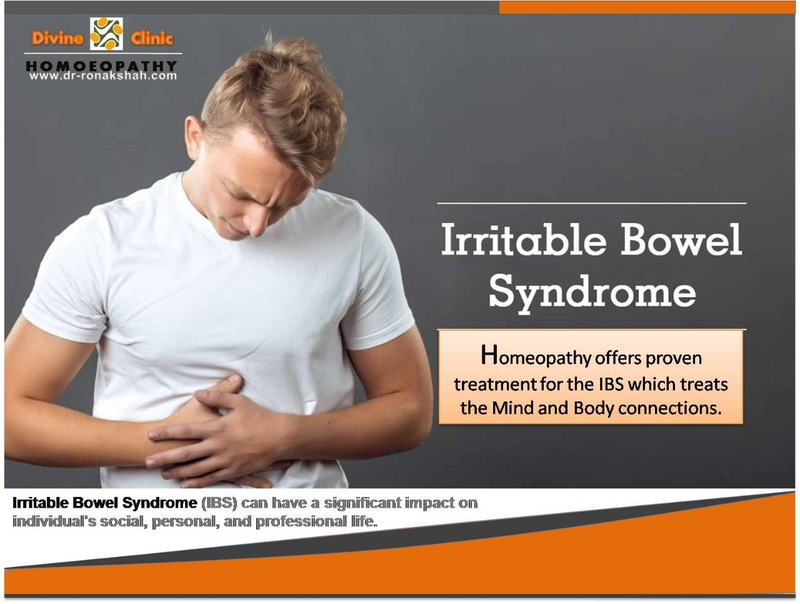 When it comes to the homeopathic treatment for Irritable Bowel Syndrome, homeopathy aims to completely eradicate or rather cure the problem. All the symptoms of the disease as well as that of the patient which may seem unrelated to the disease are taken into account before prescribing the right medicine for the patient. That is how it tends to strike at the root cause of the problem and not just the symptoms of the disease. That is precisely the reason that it is able to completely cure the problem. And that is also the reason that it takes some time to cure it. See your doctor if you have a persistent change in bowel habits or other signs or symptoms of IBS. They may indicate a more serious condition, such as colon cancer. · Muscle contractions in the intestine. The walls of the intestines are lined with layers of muscle that contract as they move food through your digestive tract. Contractions that are stronger and last longer than normal can cause gas, bloating and diarrhea. Weak intestinal contractions can slow food passage and lead to hard, dry stools. · Nervous system. Abnormalities in the nerves in your digestive system may cause you to experience greater than normal discomfort when your abdomen stretches from gas or stool. Poorly coordinated signals between the brain and the intestines can cause your body to overreact to changes that normally occur in the digestive process, resulting in pain, diarrhea or constipation. · Inflammation in the intestines. Some people with IBS have an increased number of immune-system cells in their intestines. This immune-system response is associated with pain and diarrhea. · Severe infection. IBS can develop after a severe bout of diarrhea (gastroenteritis) caused by bacteria or a virus. IBS might also be associated with a surplus of bacteria in the intestines (bacterial overgrowth). · Changes in bacteria in the gut (microflora). Microflora are the "good" bacteria that reside in the intestines and play a key role in health. Research indicates that microflora in people with IBS might differ from microflora in healthy people. · Food. The role of food allergy or intolerance in IBS isn't fully understood. A true food allergy rarely causes IBS. But many people have worse IBS symptoms when they eat or drink certain foods or beverages, including wheat, dairy products, citrus fruits, beans, cabbage, milk and carbonated drinks. · Stress. Most people with IBS experience worse or more frequent signs and symptoms during periods of increased stress. But while stress may aggravate symptoms, it doesn't cause them. · Hormones. Women are twice as likely to have IBS, which might indicate that hormonal changes play a role. Many women find that signs and symptoms are worse during or around their menstrual periods. · Are young. IBS occurs more frequently in people under age 50. · Are female. In the United States, IBS is more common among women. Estrogen therapy before or after menopause also is a risk factor for IBS. · Have a family history of IBS. Genes may play a role, as may shared factors in a family's environment or a combination of genes and environment. · Have a mental health problem. Anxiety, depression and other mental health issues are associated with IBS. A history of sexual, physical or emotional abuse also might be a risk factor. · Poor quality of life. Many people with moderate to severe IBS report poor quality of life. Research indicates that people with IBS miss three times as many days from work as do those without bowel symptoms. · Mood disorders. Experiencing the signs and symptoms of IBS can lead to depression or anxiety. Depression and anxiety also can make IBS worse. · Counseling. A counselor can help you learn to modify or change your responses to stress. Studies have shown that psychotherapy can provide significant and long-lasting reduction of symptoms. · Progressive relaxation exercises. These exercises help you relax muscles in your body, one by one. Start by tightening the muscles in your feet, then concentrate on slowly letting all of the tension go. Next, tighten and relax your calves. Continue until the muscles in your body, including those in your eyes and scalp, are relaxed. · Mindfulness training. This stress-reduction technique helps you focus on being in the moment and letting go of worries and distractions. · Experiment with fiber. Fiber helps reduce constipation but also can worsen gas and cramping. Try slowly increasing the amount of fiber in your diet over a period of weeks with foods such as whole grains, fruits, vegetables and beans. · Avoid problem foods. Eliminate foods that trigger your symptoms. · Eat at regular times. Don't skip meals, and try to eat at about the same time each day to help regulate bowel function. If you have diarrhea, you may find that eating small, frequent meals makes you feel better. But if you're constipated, eating larger amounts of high-fiber foods may help move food through your intestines. · Exercise regularly. Exercise helps relieve depression and stress, stimulates normal contractions of your intestines, and can help you feel better about yourself. · Hypnosis. A trained professional teaches you how to enter a relaxed state and then guides you in relaxing your abdominal muscles. Hypnosis may reduce abdominal pain and bloating. Several studies support the long-term effectiveness of hypnosis for IBS. · Mindfulness training. Mindfulness is the act of being intensely aware of what you're sensing and feeling at every moment, without interpretation or judgment. Research indicates that mindfulness can ease symptoms of IBS. · Acupuncture. Researchers have found that acupuncture may help improve symptoms for people with IBS. · Probiotics. Probiotics are "good" bacteria that normally live in your intestines and are found in certain foods, such as yogurt, and in dietary supplements. Recent studies suggest that certain probiotics may relieve IBS symptoms, such as abdominal pain, bloating and diarrhea. · Stress reduction. Yoga or meditation can help relieve stress. You can take classes or practice at home using books or videos. Every case calls for a detailed study of the patient individually. There are no disease-specific medicines in homeopathy. The exact treatment is determined only by "in-depth" evaluation of the individual case. Irritable Bowel Syndrome (IBS) can have a significant impact on individual's social, personal, and professional life. Homeopathy offers proven treatment for the IBS which treats the Mind and Body connections. · Slowing down of negative emotions such as anxiety, sadness, frustration, hyperactivity, anger, restlessness, etc. Most patients report improvement in about eight to ten weeks. The duration of Homeopathy treatment varies from person to person and depends upon the duration of disease, previous use of conventional medicines, the general condition of a patient, etc. 1. Ferrum Iod: Fullness, even after a little food, as if she had eaten too much (Lyc. ); a sort of upward pressure; stuffed feeling as if she could not lean forward (Nux v.). 2. Gambogia: The stool varies in character from a yellow or green watery passage to one that is partially formed. There is frequently much rumbling of gas in the bowels. The desire for stool comes on suddenly. The stool all passes at one great effort, after which there is great relief, as if some irritating substance had been removed. 3. Argentum nitricum: Digestive upsets accompanied by nervousness and anxiety suggest the use of this remedy. Bloating, rumbling flatulence, nausea, and greenish diarrhea can be sudden and intense. Diarrhea may come on immediately after drinking water. Eating too much sweet or salty food (which the person often craves) may also lead to problems. A person who needs this remedy tends to be expressive, impulsive, and claustrophobic, and may have blood sugar problems. 4. Mercurius Corrosivus: The patient cannot lie on right side; bitter taste; more thirst and hunger; continual chilliness; yellow color of the skin and eyes; fulness and tenderness across the epigastrium and hypochondria; on walking bowels shake as if loose; slimy, bloody stools, preceded by anxiety, trembling, faintness. 5. Nux Vom: Constipation alternating with diarrhea, after abusing of purgatives. Frequent ineffectual urging for stools. Strains hard on stools. Unfinished sensation after stools. Flatulent colic in the abdomen. Passes small quantities of stools at a time. 6. Sulphur: Frequent, unsuccessful desire for stools. Stools are hard, knotty and insufficient. Constipation alternates with diarrhea. Early morning diarrhea where the patient has to rush to pass stools. Heaviness in the abdomen as of a lump. The abdomen is sore and sensitive to pressure. 7. Kali Mur: Intense pain, cutting as from knives, calls to stool every few minutes with tenesmus. 8. Kali Phos: When stools contain mostly blood, are offensive. Tenesmus after stools. 9. Nat. Sulph: Chronic colitis worse in damp weather with bilious symptoms.